Please make a post in this thread with your character sheet and general background information. You may edit and make changes as you need to. light crossbow and 20 bolts, arcane focus (crystal staff), dungeoneer's pack, leather armor, 3 daggers, dragontooth dagger, dragon chess set, crocodile leather robe, augury kit, Nak Nak (lizard familiar). Personality: I hate being questioned or doubted, and find ways to punish those who would dare. Ideals: Obligation. Even if I'm a fraud, I should still do what I can to help the clan. Bonds: I've tangled myself up in a web of my own lies. Flaws: I'm profoundly lazy and will take risks to avoid physical labour or injury. Clan elders still tell stories of Krimm the Longtail, a wise and mighty kobold blessed with the blood of dragons in his veins. Though Krimm never achieved complete ascension to true draconic form as he so desired, he was a potent arcanist who used his blood magic and communion with ancient dragon spirits to defend the clan and lead it to greatness. It is widely believed among kobolds that worthy individiuals are reborn within the clan, and so when Krimm eventually died of old age, the next egg laid was immediately separated from the clutch, marked with sacred runes, and carefully nurtured until it hatched. 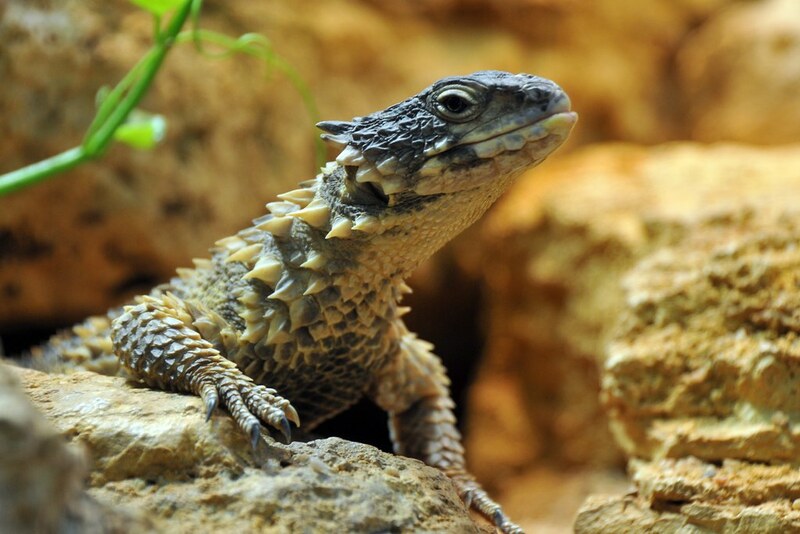 The whelp that emerged was named Krinn in his esteemed predecessor's honour, and was groomed for an eventual leadership role within the clan. 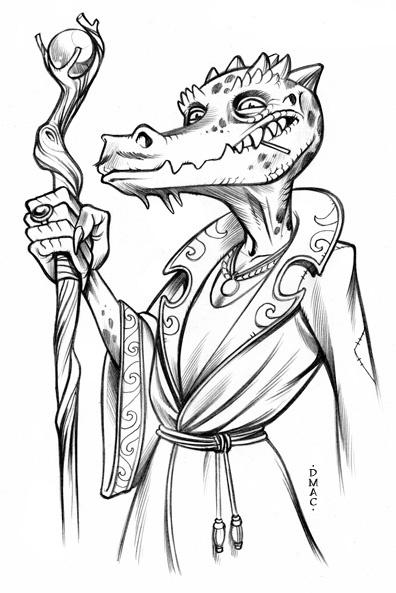 What no one could have known was that Krinn was, in fact, an absolutely ordinary kobold: fairly average in most respects, utterly devoid of magical gifts, and certainly not destined for anything special. Fortunately for him, Krinn was the first to realize he was a fraud - a secret he quickly decided to keep all to himself. You see, life in the clan can be difficult, with a lot of boring, exhausting, or even dangerous duties to go around; the the duties of an esteemed dragon cultist, on the other hand, are comparatively cushy. Once a day he consults his augury kit (nothing more than a loose collection of dragons teeth and scales he's decorated with made-up symbols), makes some vague gestures and mutters some made-up words, then pretends to see something interesting and meaningful in it all. The clan will often ask for some of his wisdom before making important decisions, and he'll share his opinion when he has one, or respond with some kind of baffling koan when he doesn't. Whenever the clan found itself in need of more hunters or able-bodied warriors, however, they always seem to find Krinn deep in meditation, in communion with "ancient dragon spirits", or in the middle of a delicate, sacred ritual that under no circumstances can be interrupted. At least, it was that easy to start. Eventually his fellow clansmen began to doubt his abilities and question his lack of progress in the arcane arts - and rightfully so! Krinn had developed a talent for obfuscation and distraction, but true magical powers were much harder to fake. Desperate to maintain his position of comfort and respect within the clan, Krinn tried everything he could to procure even the slightest measure of arcane power. He tried his hand at alchemy, he tried reciting made-up magical words and gestures, and he tried praying to Kurtulmak and to Tiamat for aid, for mercy! Why once he even tried sincerely calling out to the ancient dragon spirits. At his lowest point he opened himself up to any power in the universe that would take pity on a poor little charlatan. No, not Kurtulmak, Tiamat, nor the ancient dragon spirits, if such things even exist. Of all possible entities it was an archfey who offered Krinn a portion of his magic. And though fey are a hated enemy of the clan, and surely there would be other strings attached, Krinn was in no position to argue. He swore an oath to Nathair Sgiathach, the fey diety of mischief, and just like that, the power was his at last. Here we go for my beautiful character Feedka Soorko's backstory. Her character sheet is pretty much finished and a link for anyone to view it will be at the bottom of this post. When Feedka was a child a disease swept the tribe that caused some kobold to become infertile, this disease was most likely to effect young females, as such Feedka was rendered unable to ever reproduce. This was one of the things she looked forward to as a child and she was distraught at the prospect of her dream never coming true. Then one day she had an idea. She would raise all the tribes children as if each was her own. As such after mastering the great kobold battle art of "hit it till it dies". She became a part of the nursery. She originally specialized in teaching but as the years flew by and the numbers of caretakers of the nursery fluctuated, she would change her role to fill whatever was needed, at some times filling every role at once. 60 years since she had begun working in the nursery, Feedka has raised all but a few of the oldest members of the tribe. Now a days her only concerns are the survival of the tribe and the hatchery. Packrat has always loved to hunt. When his mentor, the previous hunt leader, died in a raid, Packrat vowed to keep his clan as safe as he could. Due to his tendency to go overboard, he has been chewed out by the clan elders more times than he can count. Being reckless, he always tries to go for the biggest prize he can, sometimes biting off more than he can chew. He has a few scars to prove it, and has had to back off from a couple of large targets, due to injury, but always comes back to the hunt. He is currently training a successor, a young'n called Drake, who seems promising, but nowhere as reckless. Packrat keeps encouraging Drake to take the initiative, but is starting to worry his training methods aren't getting through to the younger kobold. Some say that being reckless will be the death of him. Packrat shrugs, and just replies, "As long as the clan endures." As the runt of his brood Taklak was pushed around by his larger broodmates often, unable to fight back physically he resorted to pranks and small traps to embarrass them. One day, while setting up a trap Taklak fell into a hole, not a physical hole but a hole between the Material and the Shadowfell. When he woke some time later he was in diffrent part of the nest his body, already small had become gaunt, his scales dull and his body unnaturally cold to the touch. All he had were vague ghostly memories and a dark purple crystal that seemed to pull the shadows towards it. Now an adult and in a new home (that elder should calm down about that minor incident, eventually, hopefully) Taklak will keep his head down (mostly) and use his skills to help feed the clan. All the while the Shadows quietly whisper. Crawl always was different. Since he was born Crawl has always been jittery, always moving, and never turns his back to anyone. Because of his jitteriness Crawl was not very strong, but he was fast and fights dirty. He often bashed heads with others when he was younger, because of this he learned how to run and where to run.